When your business and clients are online then you must need a mode to send and receive the payments. At that time we can make use of two most famous services i.e paypal and Google wallet. 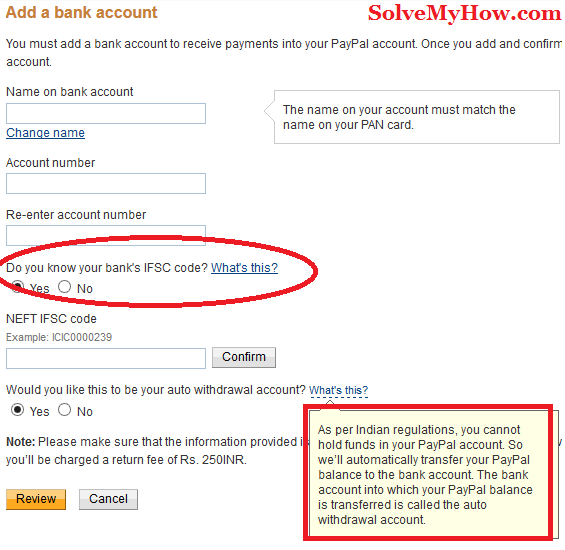 You can easily create PayPal account in India. It doesn't required any special IT skills. PayPal is one the of the oldest and trusted service to send and receive payments from overseas account since 1999. If you are a blogger then you might have noticed that most advertising network only pays through paypal. 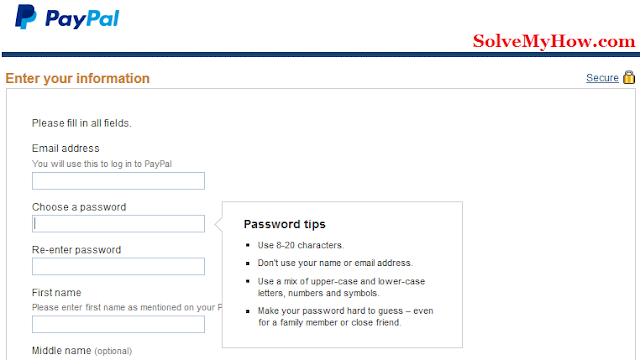 So, it is really essential to set up a paypal account for Indian users. PAN Card is compulsory. If you don't have your own pan card you can open paypal account with your father's pan card. Indian user can't send and receive payment from another Indian user. 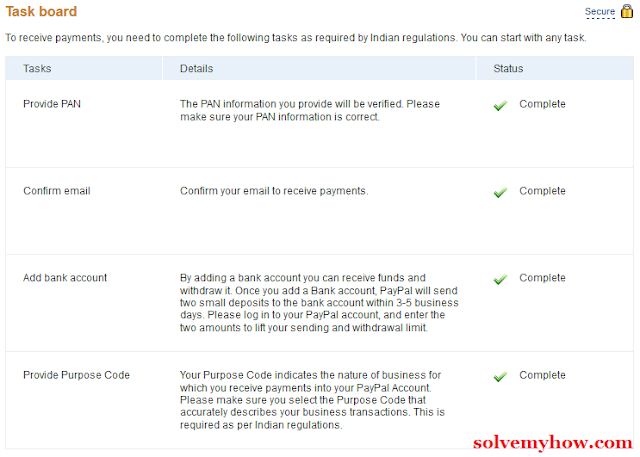 These limitations are only for Indian users, foreigners can easily create paypal account and use it. There are no limitation for them from there government. Before moving ahead lets see few benefits of having paypal account. You can send and receive payments without credit card. You can create account with debit card also. If your want to use credit card no problem but now you don't have to expose your credit card no. by using paypal. You business won't remain limited to domestic market. For bloggers, learn how to make money by joining various affiliate programs. You can send mass payments. You can send payment to multiple people at a time. You can send invoice to your client. I'm writing this tutorial as many of people get scared while creating paypal account as we have to give our bank details and personal details. But trust me its totally safe and its the best gateway to transfer and receive money. 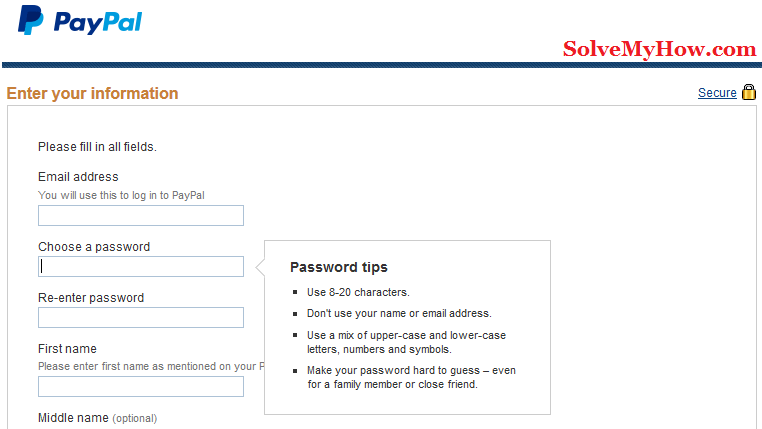 Step 1 :- Go to PayPal.com and click on sign up. Step 2 :- Select country and account type. If you are running your business online or if your are a blogger and just wanted to send and receive payments from overseas then you should go for "An account for individuals". Business accounts are paid and they have "advanced" and "Pro" packages. But they are of no use to us. So, simply go with individual account type. Step 3 :- Enter your information. Fill all the details properly and carefully. You need to write your email id and password. Mention your email Id carefully because through this you will receive your payments. P.S make sure your first name, middle name and last name are as per your PAN CARD else you cannot be able to verify your pan card. Step 4 :- Complete task board. After filling your details you will be ask to enter your credit/debit card details, you can skip it, if your are creating account just to receive the payments. 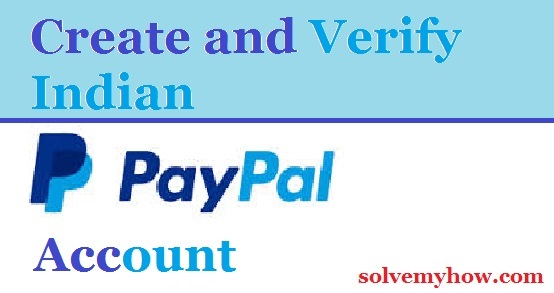 when you enter your pan card number they will verify your paypal account name with the pan card name. So, just make sure you followed step 3 correctly. If you are minor or if you don't have pan card, you can always open account with your parents name. If you have HUF pan card. Then you also have to mention HUF in "last name" column else it will show you the error in verifying your account. HUF pan cards are verified manually. So you have to call paypal customer service no. 1800 212 3852. It is toll free no. Name will be automatically fetched, just make sure it is correct. Then carefully enter your bank account number and here your also have to mention the IFSC code of your bank. If you don't know the IFSC code of your bank then you can select "NO" in "Do you know your back's IFSC code" then paypal will ask you to enter "bank name, state, city and branch location" and it will automatically fetch it. Else you can also search it on Google by writing your "Bank name and branch area" for example :- SBI satellite IFSC code or you can also check it on your check book. Once you're done filling the information click on "review" and then click on submit. Now paypal will send you 2 small deposits (so check back account after) 24-48 hours, which you have to enter while confirming your bank account. The small deposits would be like 1.03 & 1.01. To confirm, just login into your paypal account and click on link "confirm your back account". So just enter the amont, when your receive it in your account and click on confirm. It will automatically confirm your bank account. Note : this process will take 2-3 days so create paypal account today only. Now the last step is to add a purpose code. Simply from the task board only click on "start" button and you will be redirected to another page. Here you will find the long list of purposes (why your are receiving or sending the payment) like R&D, hardware/software consulting or advertising or market research. So, if your are earning money from affiliate marketing or via advertising you can select "advertising or market research". If you just wanted to use paypal account for receiving the payments then no need to link your credit or debit card. That's why I told you to skip this step above. But if you wanted to send money to someone overseas then you definitely have to link your paypal account. To do so just go to "Profile >> link/edit credit card". Simple select the card type and fill the details and link you credit / debit card with paypal. I hope this tutorial helped to setup, create and verify Indian paypal account. If you are facing any problem or if you have any query regarding creating paypal account, please do let me know in the comments below. Hi.. This is really a nice post to verify paypal acount with credit CARD. But please help me bro please.. I have a doubt that my PAN(TAX info card of India) name is VIKASH and BANK name is VIKAS is there any problem?? Paypal have their own terms and conditions for india users and I think they made tell you to open new account or you can also open paypal account with your parents pan card. But before that i recommend you to call them once on 1800 212 3852. Its a toll free no. and they will really help you. one beginner question comes in my mind. can i receive payments directly in my paypal account without having bank account, i have just created paypal account but i still don't have bank account so can i receive payments in paypal, and after creating bank account will i transfer paypal amount in bank account. Thanks for stopping by and commenting. Urrvish currently, like while creating your paypal account you can skip "add a back account" step but once you receive the payment you have to add your bank account. As paypal won't keep your payment more that 7 days. It will automatically withdraw from your paypal account. But don't stop earning. Just Try alternate. Paypal is the most trusted 3rd party money transfer.. nearly 4 plus years am using paypal, no problems and am still using for my online earnings are through paypal only. and thanks for sharing your knowledge with step by step explanation with images any one can understand easily. Thanks for stopping by and leaving your genuine feedback about paypal. True said charan paypal is the oldest and very secure money transfer site in the world. Freelancer, blogger and persons who wanted to transfer money to overseas must have paypal account. Charan thanks for appreciating our work. I'm glad to help you buddy. Would you recommend Auction Essistance for a PayPal vcc if I cannot get my own card to verify my account? Thanks for stopping by and commenting. Vonda yes its a great option to deal this. You can definitely go with it.